Performance group Parallax Beach is looking for dancers/ performers for up coming shows. Performers will participate in shows at the SoundWalk of Long Beach (October 5), Highways Performance Space, Santa Monica (December 6), and others TBA. A trio of artists, each utilizing different mediums, come together to make a unique multi-media piece. Wes Johansen creates a visual representation of abstract thought through digital video projections, with live editing and synchronizing directly to the soundtrack. Mike Meanstreetz uses avant-garde percussion and composition techniques tangling the audience in a web of Synthesia. These elements are accentuated as josie j conveys transformation to audience through ritualism/ meditative movement influenced partly by Butoh training and background in performance art. 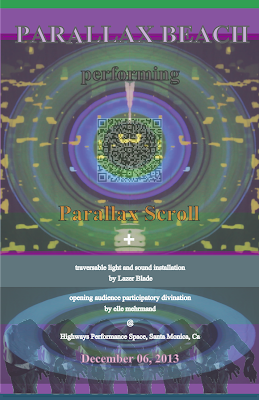 New performance piece Parallax Scroll will take the audience on a voyage through the emergence of life. Starting with imagining first sight, the emergence of language, and the development of society -- culminating to the end of time. As part landscape, characters, and elements performers will transform self and space. Performance will have a ritualistic/ transcendental format with the goal of causing change to audience and artist.